Barely three months of association and a certain govt shelter home for girls has become the most satisfying as well as the most depressing and frustrating beneficiary group that ProjectKHEL works with. Male coordinators weren’t allowed, so I was the only full time person going there with a couple of other female volunteers. Every session became a special one and every story important enough to share with my colleagues. Here are a few of them which I can never get over with. Since the very first session, Seema had been the attraction of the session. She was supposedly a new entrant in the shelter home and had been a beggar till before that. Apart from running around like a little rat, she found immense pleasure in troubling the coordinators by tickling or chasing them around. It started getting depressive for me when I realised that all she said or wanted to say was “didi, ek rupya de do…” Initially we would laugh it off, but it got worse when she started banging her head against the floor and at times pretending to strangulate herself if we didn’t give her money. I tried talking to her. I asked her what she would do with the money because her needs were anyway being taken care of at the shelter home. She only stared back at me then grabbed my leg saying “didi ek rupya de do…” It felt horrible. This 8 year old didn’t know why she needed the money, but she knew that she needs to ask for it and ask for it how! Rama Rupa would always be seated near the gate. She was sad. Obviously sad. She never joined us for the session, but made sure she was present for all of them. A couple of times we had talked her into playing with us but she would generally prefer to sit and watch. She never smiled. I never saw her happy. One time she was able to catch a ball I had thrown to her. I made everyone clap for her. She clapped too, but she did not smile. The one reason why I can never get her out of my head is how she always asked me, “didi, tum ghar pe rehte ho? Mummy papa hain? Mere mummy papa nahi aaye mujhe lene. Tum mujhe apne ghar le chalo” I knew I couldn’t take her home and it killed me every time she asked for it. I would only smile back and say “tum khelne lago humare sath, mazaa aayega”. She never really joined us, but one day we were told that she had been restored with her family. I was happy for her but somewhere there was this longing to see her face when she had finally seen her parents. Shaheen was supposed to be one of the “mental” kids (term used by the girls themselves) at the shelter home. 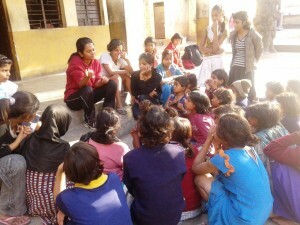 She had never attended our session, until one day we saw her looking at us playing with the other girls and smiling along. We asked her to join us. She was more than happy to be a part of the group. Her hair was messy and had lice in it. Her clothes were filthy. The next day she was at the play space even before we reached and as we entered the gate, she was the first to jump up and come running to greet us. She asked if we remembered her from the previous session. She had liked it and wanted to join us again. We were more than happy to have her. As we began the session, asking the girls to get into a circle at the count of 3, Shaheen was the only one who ran around, putting girls in their place and making sure everyone was standing in a proper circle. She kept telling others how the didis are getting tired of asking them to get ready so we can start playing. The session after that was pretty chaotic. We were told that all the specially-abled girls were being sent off to another home which had better facilities for them. Many of the girls were losing their friends and so they were in tears. Shaheen, too, was amongst the group of girls who were leaving. She ran up to me that day and said “didi, tum rona mat. Main aa jaungi jaldi. Tumse milne aaungi. Apne mummy papa ka khayal rakhna. Mujhe bhulna mat aur mere liye rona mat.” I was so touched by her words that I was actually in tears at that time. I should have known better and definitely have not cried, but what hit me the most was this girl was suppose to be the one with mental issues and the mentally fit people were the ones who were shouting at the children to get them into a line and had no regard for the emotional trauma which was happening as the girls were being separated from their friends. There are more such stories, both negative and positive, that have affected me in many ways and also made me realise a lot of things, but somehow these three would be the ones I will not forget for a long long time.